Process, process, process…if you don't like your painting process then there's no point in painting. Sometimes the process can be quick; other times it's slow. At times, the process can fail you completely. But the minute by minute, day by day approach from a blank canvas to a completed painting should be, simply stated, a creative nirvana. Here's American artist Mel McCuddin demonstrating his process…from a random application of paint on canvas to finding and refining images in that random surface. Bits and pieces of quick photo grabs were combined to make this composition. My wife and I share driving along Hwy 401 into Toronto. When I'm the passenger, I have my smart phone or ipad at the ready to capture any drive-by scenes that might have possibilities. 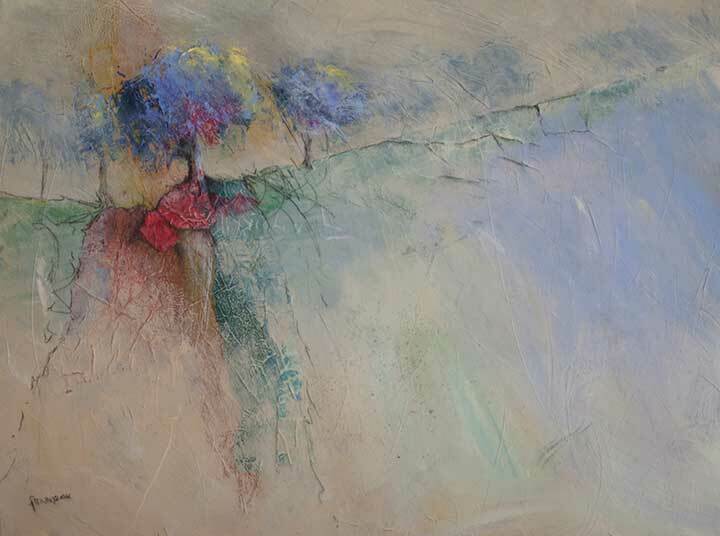 Sometimes the photos are blurry; sometimes I question why I even took the photo, but other times I'm delighted with an image or piece of an image that I can use in a painting. 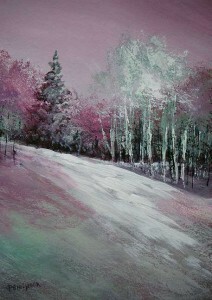 This painting, called "Out From the Dark", 18" x 24" and painted in oils, has several sections from several photographs. I cropped elements from various photos, added them to a page in Photoshop and manipulated until I found something I liked. My Photoshop cropping is pretty rough so once I'm happy with a composition I do a small sketch either in a paper sketchbook or a digital sketchbook. And that becomes my composition. Next step was to decide on concept and color. The foreground of a couple of the original images I used as resource was filled with construction equipment. I wanted something a little more pastoral and I discovered a photo I took of a large shadow on grass – just a shadow; just some grass. Weird, but the pic was in my files. Turns out that shadow became the reason for the painting. Here's a little exercise I did using one limited color palette, the same design and a complementary color scheme to create two different looks. I used an acrylic palette of Hansa Yellow Medium, Napthol Red Medium and Phthalo Blue (green shade) along with Mars Black and Titanium White to create these two paintings. The top painting is a red/green color scheme, the bottom painting is red-orange/blue-green and I created both using various mixes of the yellow, red and blue palette mentioned above. This is a great exercise in value control. Since the palette is limited, the focus needs to be on creating a range of values and a range of color temperatures that will adequately create the illusion of space and tell the story. 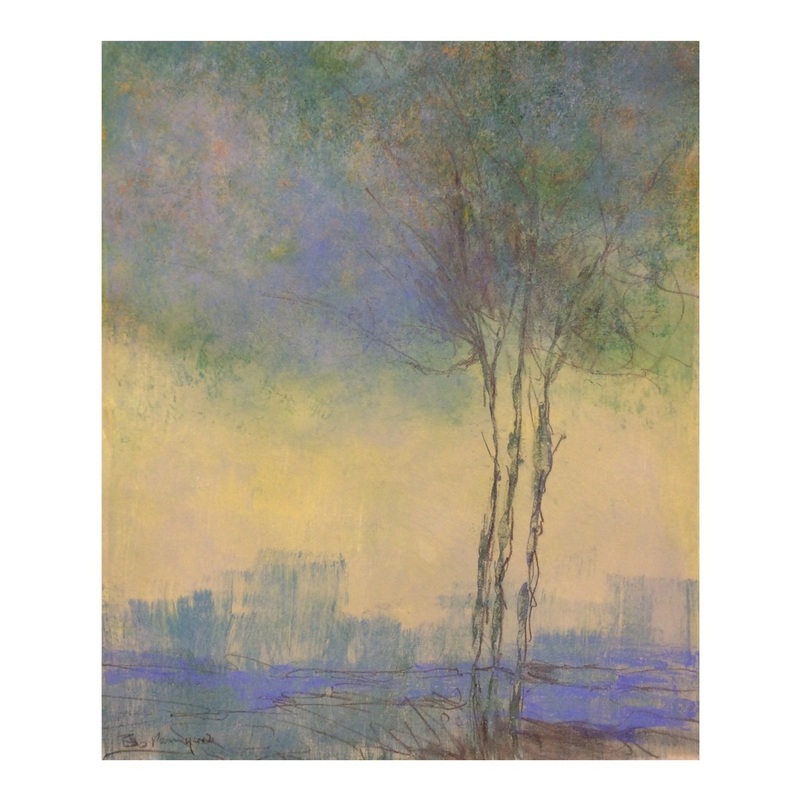 Values that are close tend to flatten the area (see the sky and lower foreground in the top painting) and values that offer greater contrast separate the shapes and make some of them stand out (see the tree line in the above painting). While I used white to create lighter values, I only used a little of the black to create darker values. Black tends to deaden the color Instead of always using black, I prefer to mix the two complementary colors to create some darker neutrals that are much richer than they would be if I used black. And finally – well, this actually should be an early decision in the process – I decided on overall color temperature of the painting. Should the painting be cool or warm? The top painting has a dominant red appearance making it a warm painting; the bottom painting is obviously much cooler with only a little of the red-orange used in the mid-ground. "At Dusk", acrylic and image transfer on a 12" x 6" cradle board. Somewhere beneath the layers of paint is a photograph of my backyard. And what started as an image transfer became something else. I wanted to create a soft spring look so I covered the surface with pale greens and yellows. But the image I transferred to the top third of the surface was a copy of a winter shot of my backyard; no snow but lots of bare trees and darkness. So I changed direction, changed color palette and moved the feel of the painting from spring to autumn using lots of Sap Green and Transparent Red Oxide. The image transfer contained evergreens with a centre focus of birch trees. It was the birch trees that attracted me to the scene and it was the birch trees I wanted to save. But I felt the rest of the image could disappear. I kept some of the birch trees from the image but decided to expand upon what attracted me in the first place. So I covered most of the transferred image with painted texture using a painting knife and I built the birch trees out from the image and into the painting making them the subject. Only a small part of the original image shows at the top of the painting, buried under paint and texture inspired by the image. 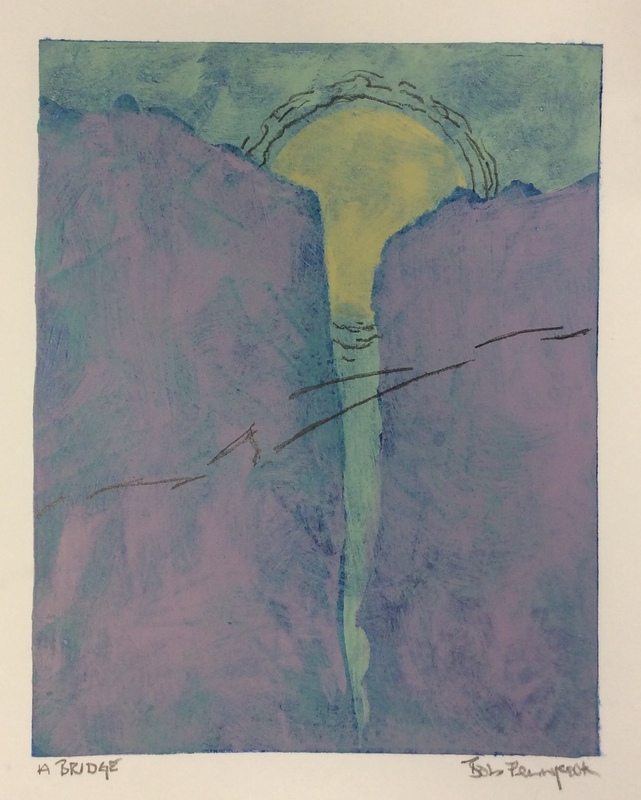 Oct. 11, Monoprinting using the Gelli Plate. 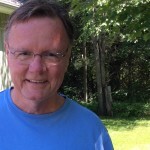 All classes are held in Tweed, Ontario. For more information, check this out. For still more information, contact me. 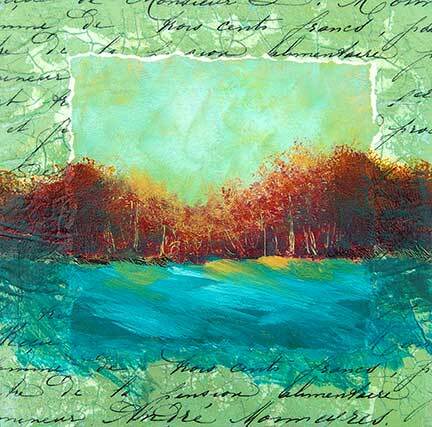 When I create a monoprint on a Gelli Plate I mat the finished print leaving a 3/4 inch border around all four edges. However, with this print, I trimmed the paper right to the edge of the image and therefore couldn't mat the print without losing a good deal of the image area. Instead, I chose to glue the print to a cradle board and build from there. I gessoed the cradle board (8" x 8"), then adhered the print using Golden's Soft Gel Gloss. I spread the gel thinly over the entire board, placed the image on top, then, wth a piece of waxed paper on top of the image to protect it, I worked a brayer back and forth gently to ensure good adhesion. I then put low tack painters tape over the entire image to protect it and then smoothly applied Golden's Light Molding Paste to create a raised border. (Remove tape before paste dries.). 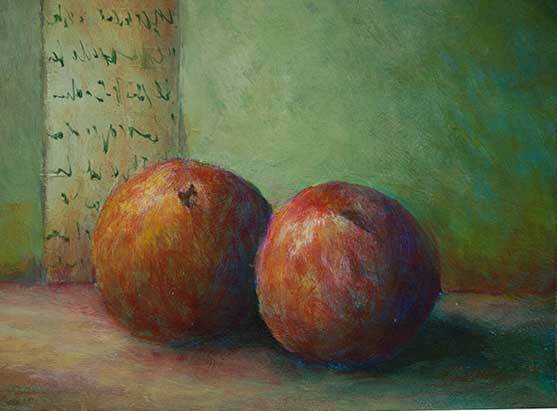 Once the paste dried I washed Golden's new QOR Watercolors over the border to tone the color. 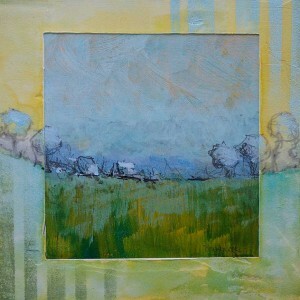 I used a couple of different yellows and a soft blue. The watercolor tended to soak into the paste. Next, I taped some vertical lines and used a sponge to dab on strips of blue acrylic in the upper right and green acrylic in the lower left of the border. Finally, I used a 2B pencil to create a tree line and some shapes on the horizon. 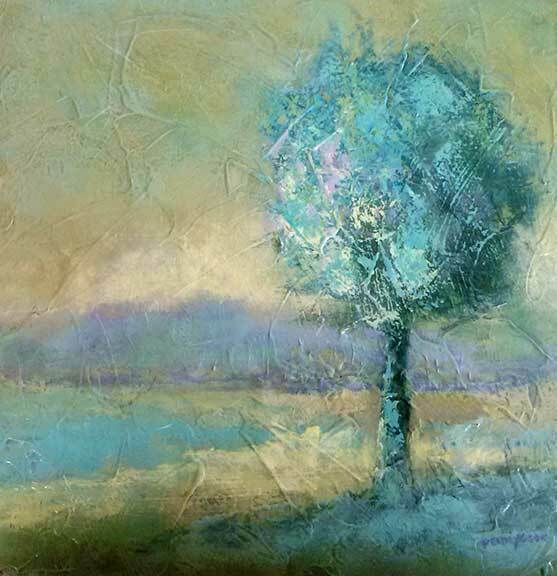 I dabbed some acrylic highlight colors into the tree foliage and the horizon shapes…and I considered it a day! I haven't varnished this, but you could. Just carefully apply a thin layer of gel medium over the entire surface (working gently so you don't disturb the graphite), then, when the gel is dry, varnish. 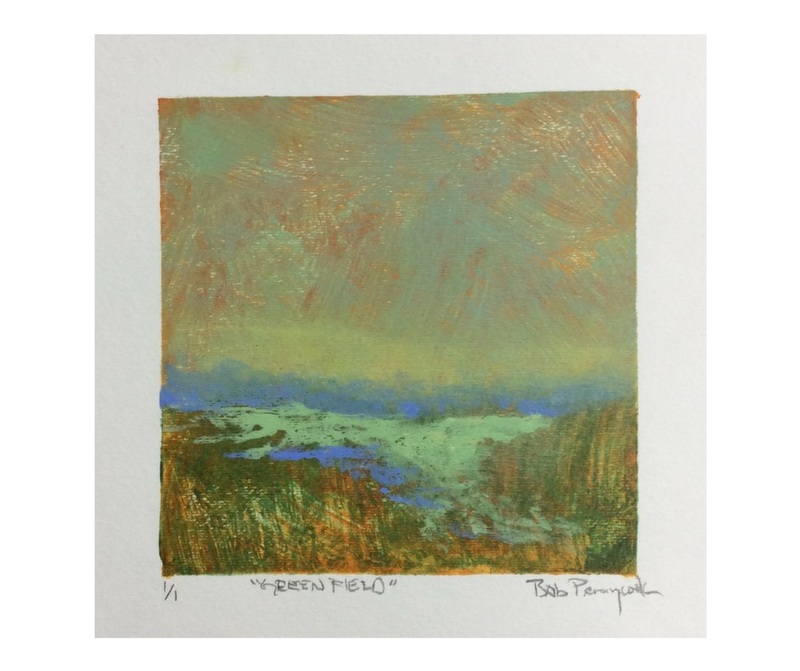 I started by creating a monoprint using a 6″ x 6″ Gelli Plate and Golden Open Acrylics. You can see the print in the image. Search in the middle for the two rough vertical white lines and the horizontal white line. The sky is a combination of yellow, green, blue and white. The trees are red and orange and blue with some scratched trunks. The land was the same color as the sky…but clearly I changed it! I then wanted to develop the idea a little further. I applied Golden Crackle Paste to a 10 x 10 cradle board. I use these wooden supports instead of strectched canvas when I want a firm support. And the crackle paste needs a firm support. After drying the crackle paste overnight I washed it with a green acrylic mix, and, after the green dried, I sanded a little off the paste to create a smoother surface. 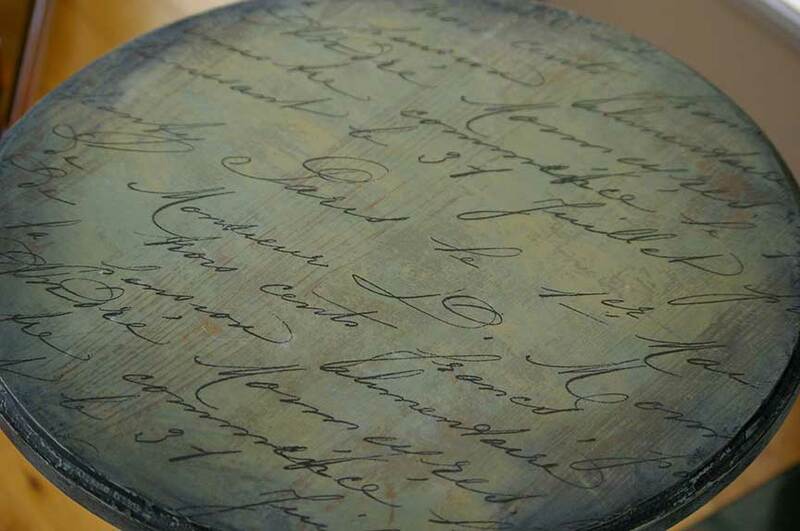 Then I brushed Golden Soft Gel gloss over the entire surface and laid a French script from The Graphics Fairy on top. I let this dry overnight then removed the paper by misting then rubbing with a nylon scrubby until all paper was removed and only the black type was left behind. After tearing the edges of the monoprint to create a rough white outline, I applied soft gel gloss to the entire surface again then laid on the print. 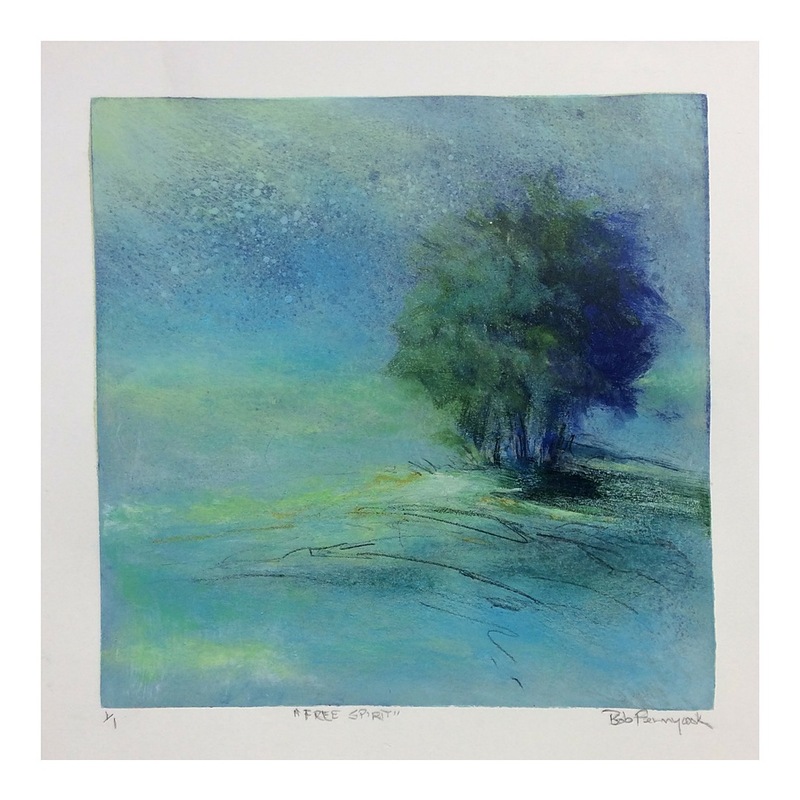 I place a piece of waxed paper over the entire surface and gently rolled with a brayer to make sure no air bubbles were left behind, and the print was nice and flat. I let this dry overnight then I added some paint, extending the tree line and creating a new foreground color. Another coat of gel medium, this time regular gel gloss and, after the gel dried, a topcoat of varnish and it’s done. From the deep recesses of my studio storage I found this table sitting bare naked in the back corner. We needed a side table for a sitting area so I decided to tree some chalk paint with a photo transfer. 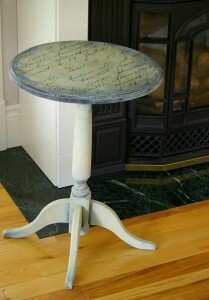 I based the table with Annie Sloan chalk paint in Duck Egg then drybrushed with Versailles. The photo transfer was found on The Graphics Fairy website. The copy prints as an 8 x 10 from the website so I took the small print to an architectural copying firm and they enlarged the image to fit my table top. 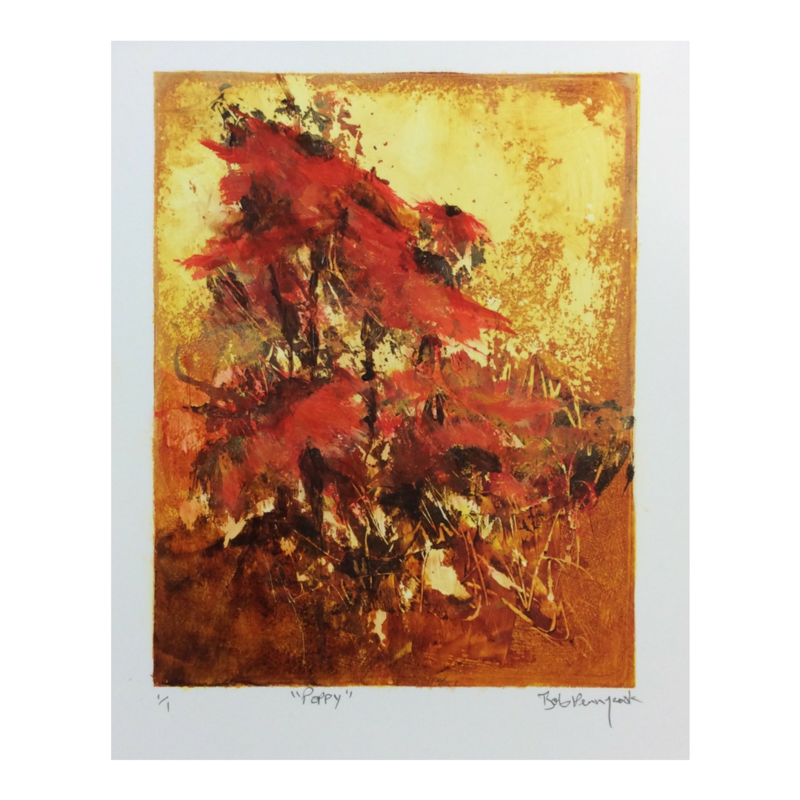 I covered the table with Golden Soft Gel gloss; placed the image face down on top (you want to make sure the image on the paper is the reverse of how your transfered image will appear), the gently rolled the back of the paper with a brayer to smooth out bubles. Let dry overnight then wet the paper with water and started removing the paper with a nylon scrubby, pressing gently. Dried the paper and repeated this process until only the writing was left on the table and all bits of fuzzy white paper were gone. 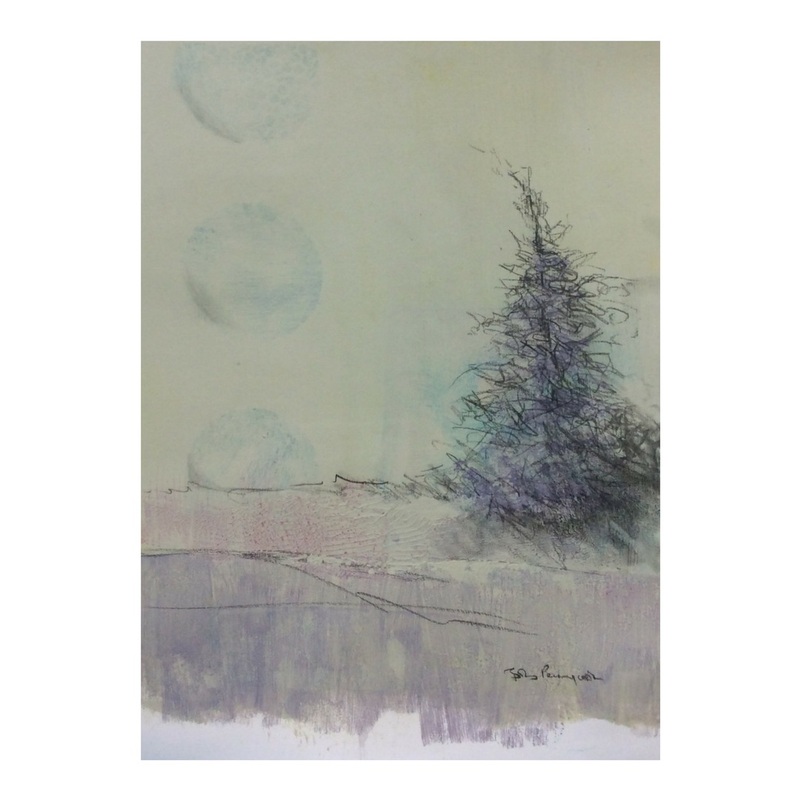 (The ink from the photocopy sits on top of the paper and is transferred into the gel medium while the medium is drying making it easy to remove the paper backing.) Once all paper was removed and the surface was dry I coated the top with a layer of matte medium. Then I used a little retarder with Payne's Grey and Napthol Red Medium to create some antiqued areas on the table. I painted the table top rim with the same color then sanded it loosely after it dried to create some texture. A final polyurethane varnish coat to protect the table and I was done. Notice the texture on the table top. I like it a lot. I'll recommend you use 200 grit sandpaper after painting (and before applying the transfer) to remove some of the paint and create visual texture. But here's how I did it. I completed the table top but I created the transfer using a few 8 x 10 prints. It looked too rough and "pasted on" so I decided to remove it and start over with a larger photocopy. I used a palm sander to start removing the transfer and gel. At one point, I noticed a little tear in the gel and decided to pull that off before continuing with the sanding. As I grabbed the small piece of gel and started pulling, all the gel on the table top came off in one large piece, and it removed some of the paint as well. So what you now see under the writing is what appeared after I removed the gel. I liked it so I used it. I don't recommend you follow the above steps to get your texture but I wanted to tell you about the experience just to show that sometimes mistakes can create wonderful things. For a while, it’ll be three colors and three colors alone. 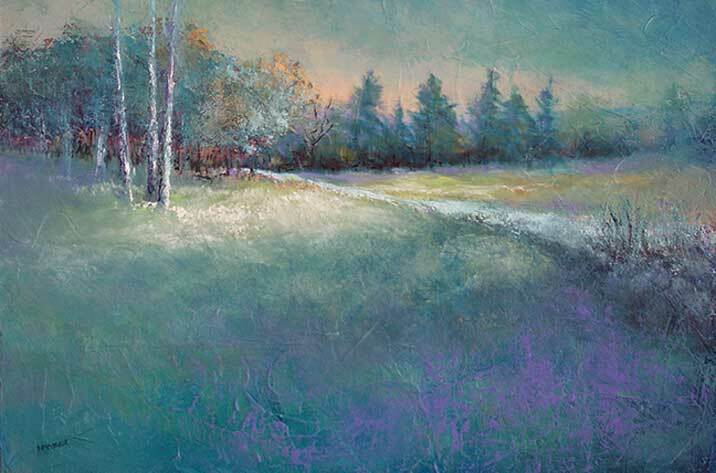 The same three colors over and over to create paintings with rich and varied color. 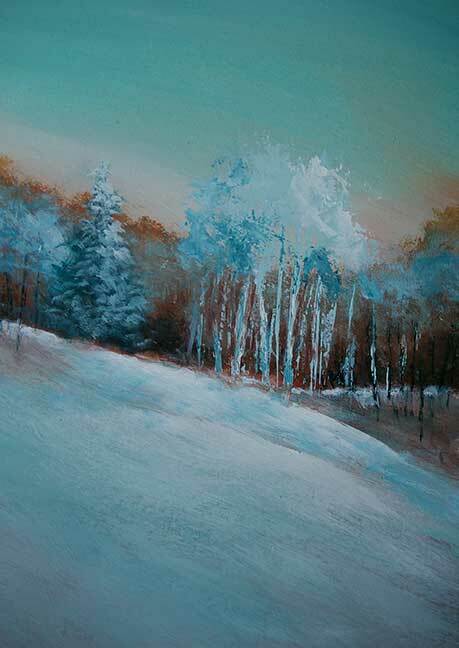 I’ve been focusing on teaching “limited palette” classes lately. So I decided I would try it myself. I limited my palette to three colors plus black and white. The three colors I’m currently using are Hansa Yellow Medium, Napthol Red Medium and Phthalo Blue (green shade) plus Mars Black and Titanium White. The painting above uses all of these colors. Each mixed color contains a little black to dull the intensity then as much white as is needed to create the tone/value I want. The limited palette is a great exercise to force you to work with values. And it’s amazing how varied the colors can be. 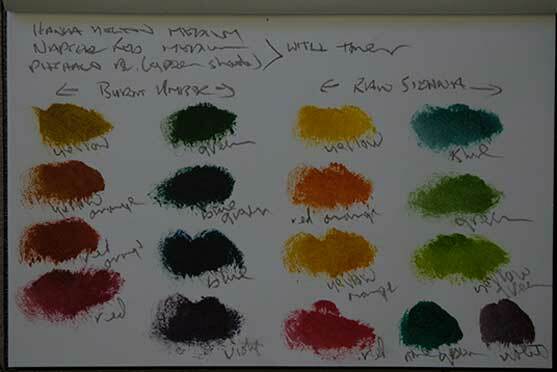 with a toner added to the three current colors in my palette – Burnt Umber for some of the colors, Raw Sienna for others. The book is a great resource if I need a little nudge. Sometimes the color chips will be the start of a new painting. And just to show you how varied your paintings can be using a limited palette, here’s a picture of a small still life painted with the same three colors. Last year, I planted peppermint in my garden. This year, peppermint took over my garden. To control it's growth, I removed all but a potfull of the herb. But I put it in a plastic planter…and I thought the plastic planter was kind of ugly. So I bought some wood and started building a wooden planter around the plastic pot. I had no idea what I was going to create. I just started cutting wood! I knew it had to be bigger than the plastic pot. And I wanted the wooden slats to be about the same size as the wood on our hardwood floors. I also wanted a gap between each wood plank in the hopes that water wouldn't collect inside the wooden pot. The wood had to be pine, not pressure treated, but I settled for spruce once I saw the price of pine! I think it weighs somewhere around two tons on the scale. There's a wooden frame on the inside then the planks on the outside. I have a very fancy mitre saw…but I can't cut mitres to save to my life. So I just used straight cut wood to build the lip on the planter. Feet are pressure treated fence post finials. This will be exposed to all weather conditions so I kept the paint job simple. I decided to paint it to match some deck chairs I painted a few years ago. So the background is floor paint from our verandah, the white is Kilz, the yellow and green are acrylic gouache then I spattered everything with the same colors. Once it dried I used an electric sander to remove paint from all the edges and from some of the painted design areas. 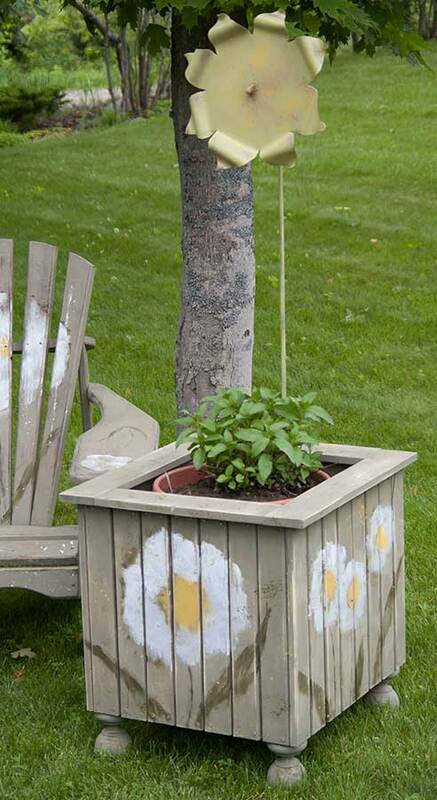 I spray painted a rusty metal flower and fastened it to the back of the pot then added my planter of peppermint. We'll see how well the wood and paint combo holds up this summer.If I get one season out of it I'll be happy. A lot of work for one herb. But it's an important herb to me. It's a major ingredient in the ice cream I'll be making this summer! 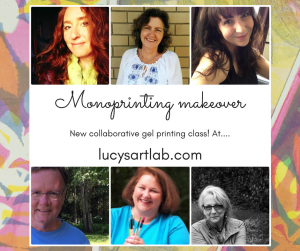 Join me in a new online collaborative printmaking class with several hours of video and info. Join before Sept 1 and get 25 percent off your registration fee if you use the code MAKEOVERMADNESS. For more info, click the image below. 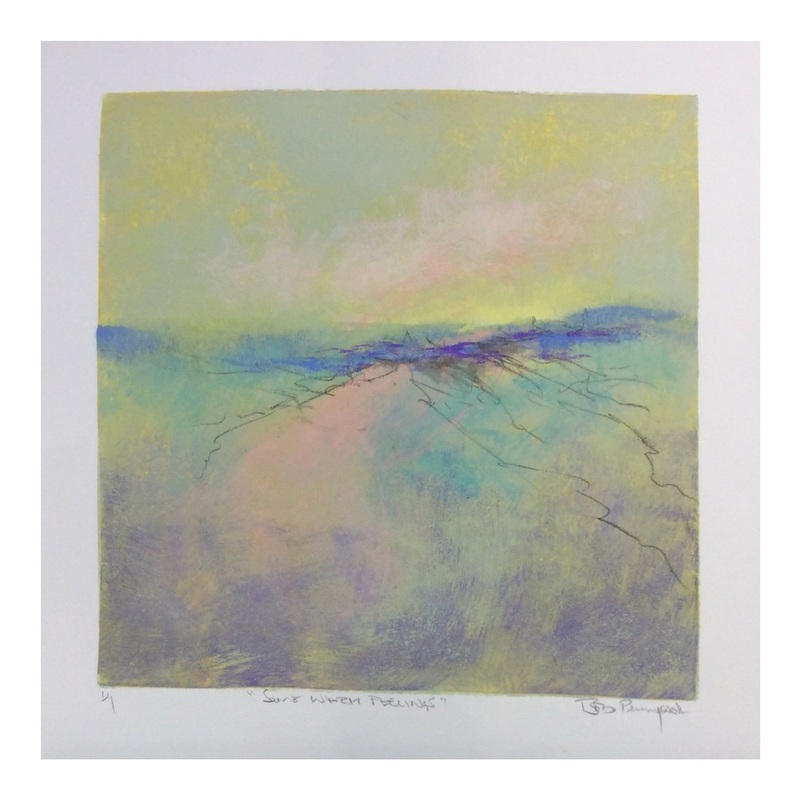 If you’re interested in any of the substrates I use in the monoprinting posts on this blog, click on the button below and it will take you directly to the products page. And, if you buy, using the code BobP, you’ll save 10 percent off a $20 minimum order. I've been a working artist for over 20 years. My subject of choice is nature - broad expanses of nature or small, tabletop macros of nature. 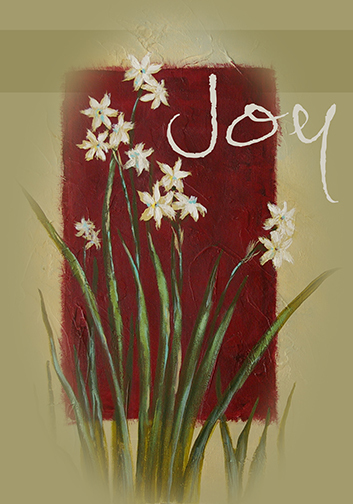 I create paintings and prints using acrylics and oils.